Halloween is big where we live. Not the sort of big where you lackadaisically put out a half-hearted pumpkin and bung a few sweets in the direction of trick-or-treaters, but the sort of big where people have robot butlers, smoke machines, ten-foot inflatable pumpkins and giant projections onto the sides of their house. Of course, this spectacle (please award bonus points for not making the “spooktacle” pun) means that there is a hefty suspicion that non-local kids get bussed in from nearby areas to hit up the neighbours. I’m sort of OK with that, even if it did mean that we ran out of 500 sweets by 6.30 p.m. 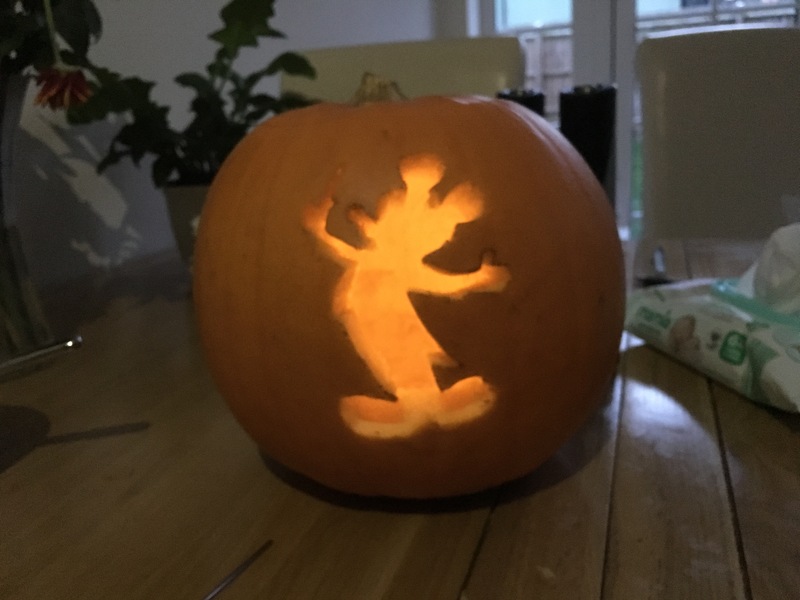 Kids are mostly respectful, and only knock on doors where there is a lit pumpkin outside. It’s certainly a far cry from my first trick-or-treating experience. I had just turned six, and was living in the Midlands. My mum would have been heavily, heavily pregnant. I was told I could dress up (I have no memory as what), and I was allowed to go next door, by myself to trick-or-treat on just one house. I reached for the doorbell, heart in my mouth. 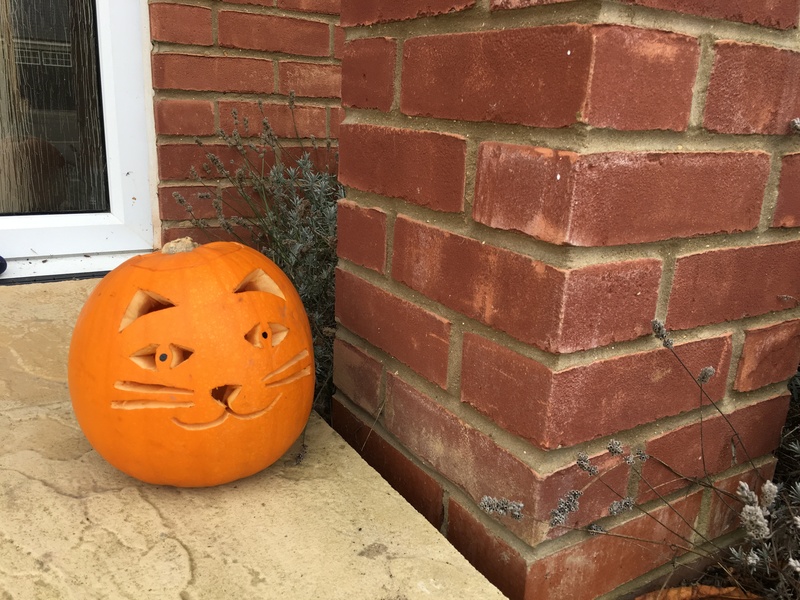 “Trick or treat!” I said, probably a bit nervously to our next-door neighbour. What followed was not a lovely chocolate bar, lollipop or sweet. Instead, I got a ten-minute lecture about a) begging b) how nasty people put razor blades in apples and c) how I should go home right now. I did indeed go home right then. I had two questions of my own a) why anyone would put razor blades in an apple and b) what self-respecting child would either accept an apple as a Halloween treat, and if they did accept it, why on earth they would eat an apple, when they had shitloads of sweets? 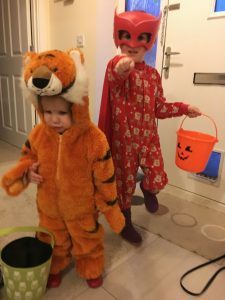 Last night, we duly dressed our children up as Owlette (EldestGirl’s favourite from PJ Masks. The mask alone was a tenner, and was one of her birthday presents. 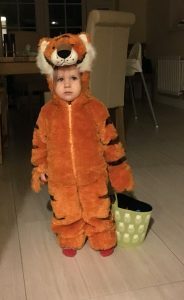 She could go whistle if she thought she was getting the rest of the £30 costume, so she made do with some reindeer pyjamas and a red cape) and for YoungestGirl, we gave her a super definitely not left over from EldestGirl’s previous Halloween bottom of the dressing up drawer tiger costume. So neither were particularly scary, but I quite like the more American tradition of fancy dress rather than trying to be something spooky. It gives a wider net to cast. 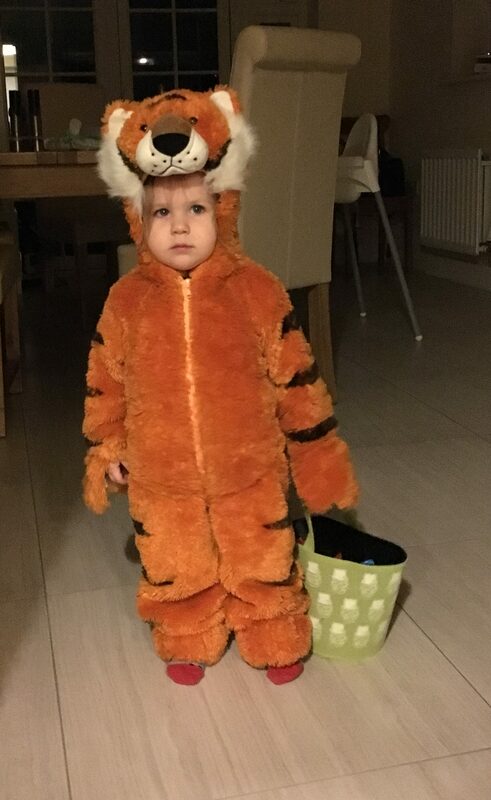 This was YoungestGirl’s first Halloween out trick-or-treating; a year younger than her older sister was when she went out with us for the first time, YoungestGirl is always keen to follow. She got the hang of it pretty quickly. Ring on a stranger’s doorbell, they offer a bowl of sweets, grab a sweet, onto the next. After half an hour, her little bucket was so full of sweets she was literally dragging it on the ground behind her. TheBloke (TM) tried to help her carry it, but it could not be prised from her sticky little tiger paws. My children got so much loot that even if I let them have one packet of Haribo every day, they would still be eating their way through their Halloween buckets by Easter next year. 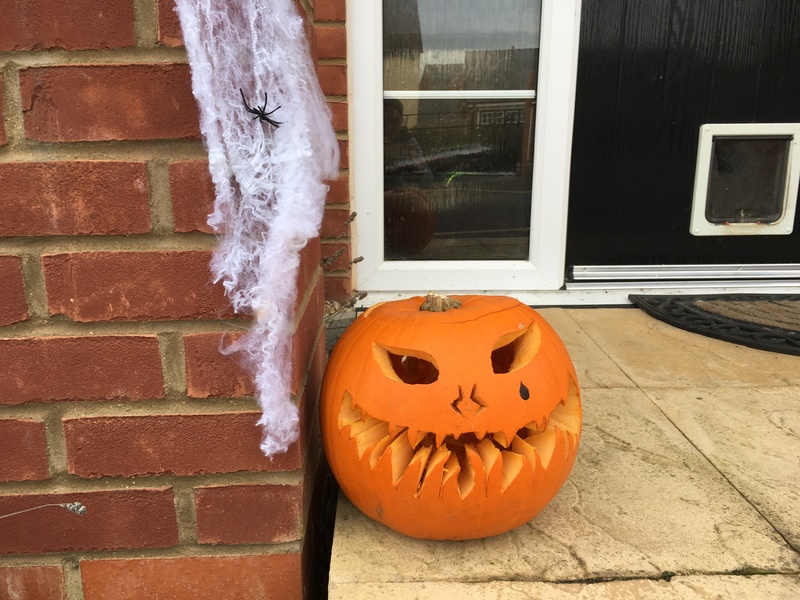 I briefly considered re-lighting our pumpkins and handing the sweets back out to the neighbours, but we’d started the children’s bedtime routines by then, and didn’t want the doorbell ringing all evening. So sadly it looks like Mummy and Daddy will be in charge of sweet-disposal again this year. Sigh. The sacrifices parents make. 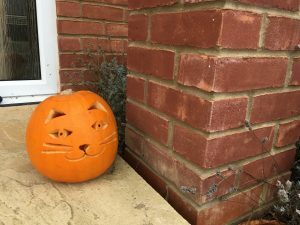 Speaking of pumpkins, TheBloke(TM) is something of a pumpkin carving artist. 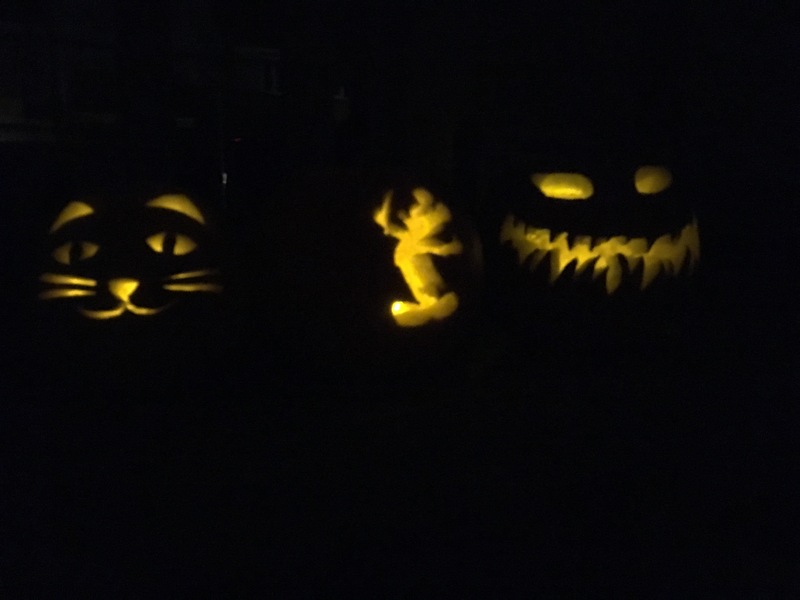 EldestGirl asked for three pumpkins this year. We said two. She said she would really like three. 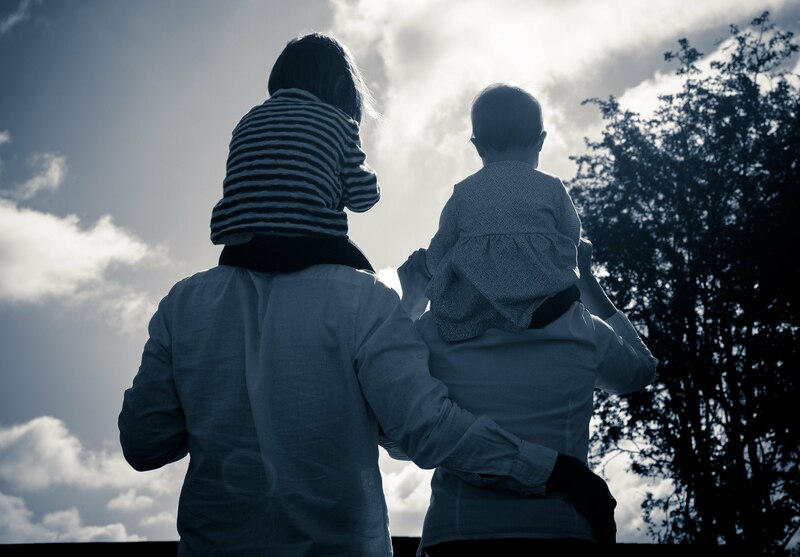 We said absolutely not, two is absolutely the limit; we are not getting more than two. She mentioned again that she would like three pumpkins. We were very clear that under absolutely no circumstances would we be buying three pumpkins. Here are our three finished pumpkins. Looks like you all had a good time- great photos and impressive pumpkin carving! Wow, the Mickey Mouse one is amazing!